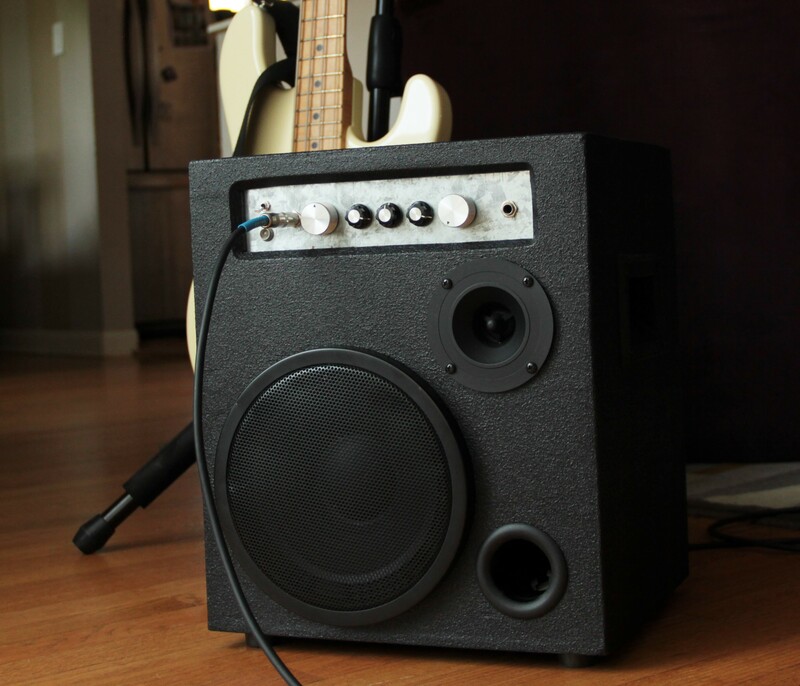 A solid state bass guitar pre-amplifier designed to have a flexible effects path and high gain tone control. The input is a buffered high impedance fixed load design to allow long cable runs and minimal passive pickup loading. The input gain is adjustable to accommodate a wide variety of bass guitars. There are two effects loops separately mixable with individual high cut tone controls. Each effects loop has 2 TRS insert points, one for the front panel for pedals followed by another on the rear for an outboard compressor. Effects loop one contains a simple adjustable fuzz circuit, a front panel on / off switch and an additional TRS jack for a remote bypass switch. Effects loop two is intended for clean only operation and has no additional features. After the effects loops are mixed with their own level adjustments, the signal enters a high gain three band shelving tone control. The master output volume is next followed by a third order active crossover. There are two full range outputs, on both the front and rear panel, and a high and low pass output on the rear panel. A solid state combo amplifier designed for compact portable use without sacrificing sound quality. Clean reproduction can be utilized for any input source. The design combines a simple input gain system and a three band shelving tone control with a 100WRMS power amplifier and two way speaker system. Details on the design and re-build of this amp are published here.